ONE OF THE THINGS I DO DIFFERENTLY THEN MOST MECHANICS IS GET THE JOB DONE AS QUICK AS POSSIBLE. UP HERE IN THE GREAT WHITE NORTH WHEN THINGS BREAK THEY BREAK BIG TIME. 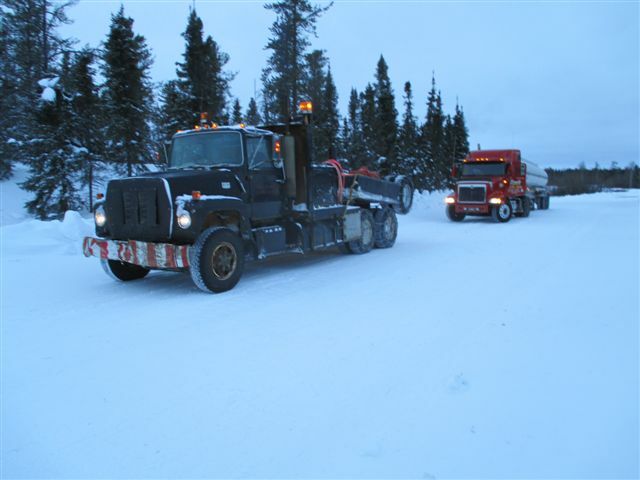 PLUS IN THE PAST IT WOULD COST THOUSANDS OF DOLLARS FOR 2 TRUCKS TO HEAD UP THE WINTER ROAD TO GET ONE BROKE SEMI. 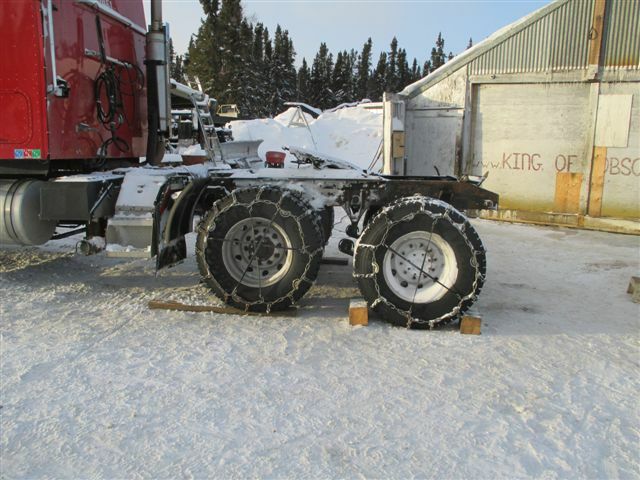 SINCE I DON'T HAVE 2 SEMIS TRUCKS IN MY "BLACK FLEET" I FIGURED OUT HOW TO GET A BROKEN TRUCK OFF THE WINTER ROAD THE MOST COST EFFECTIVE WAY. THIS GROUP OF PICTURES WILL SHOW HOW I DO THE JOB. 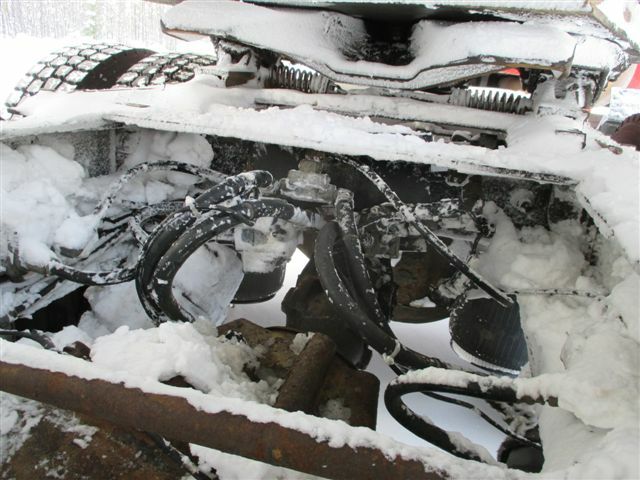 I GET THE CALL THAT A WINTER ROAD FUEL HAULER HAS BROKEN BOTH BACK SPRINGS ON THE TRACTOR UNIT. 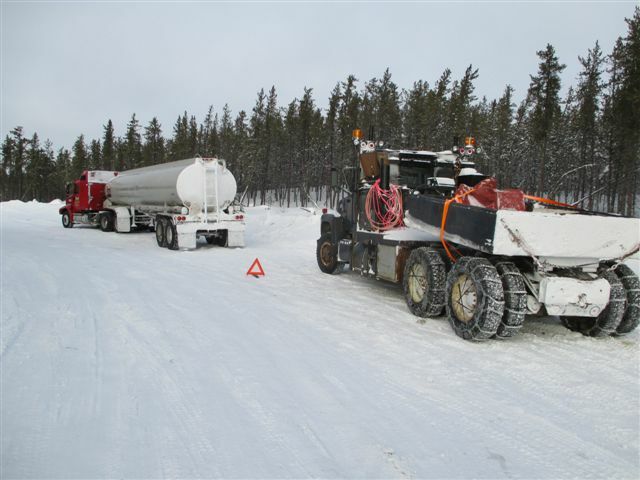 HAULING FUEL IS VERY HARD ON EQUIPMENT BECAUSE THE FUEL IN THE TANKER IS NOT LOADED RIGHT TO THE TOP SO THERE IS MOVEMENT OF THE FUEL. THE MOVEMENT OF THE FUEL CAUSES AN EXTRA BOUNCE MOVEMENT WHEN GOING THROUGH THE ROUGH PARTS OF THE ROAD. THIS IS HOW THINGS GET BROKEN. 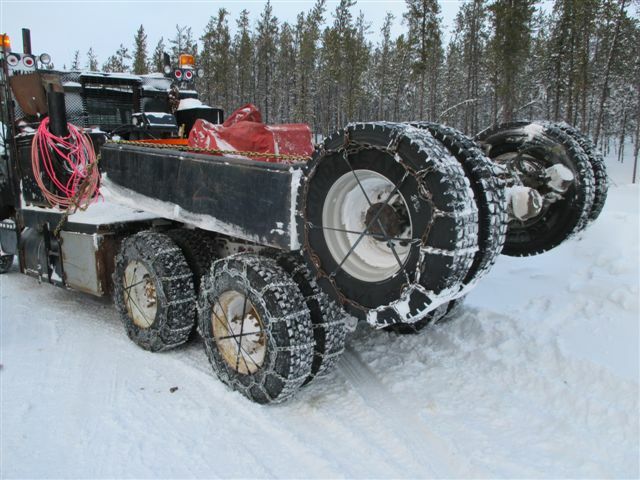 I ONLY TAKE THE "SCREAMING FORD" WTH THE WEIGHT BOX ON THE 5TH WHEEL FOR A RECOVERY LIKE THIS. 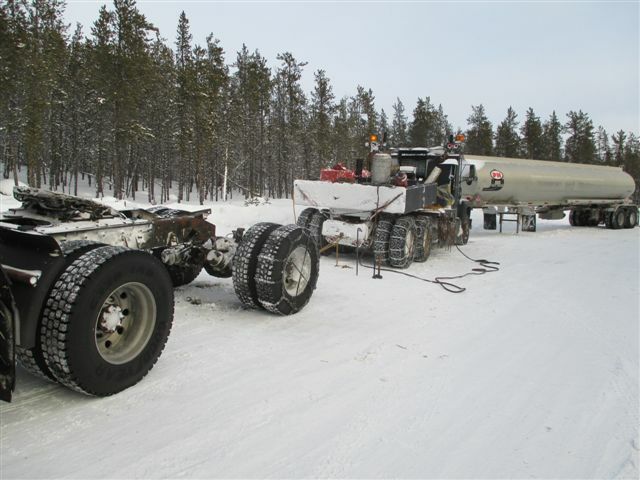 IN THE PAST IT WOULD BE ONE SEMI BOB-TAILING TO BRING THE FUEL TANKER TRAILER OUT AND I WOULD HAVE THE BEAVERTAIL TRAILER TO WINCH THE BROKEN SEMI TRACTOR ON THE DECK TO COME OUT. 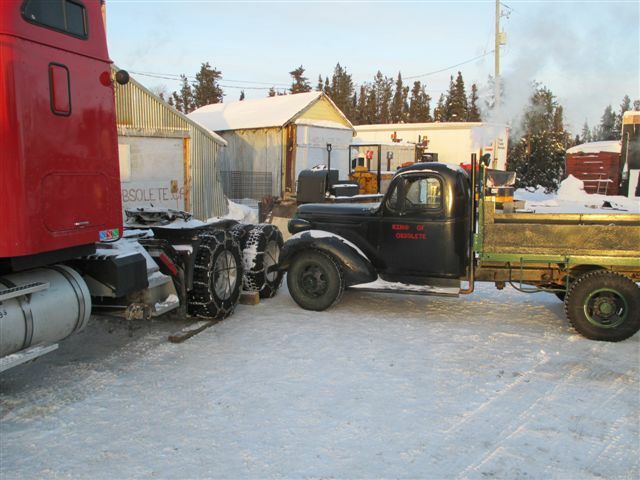 I HAD DELIVERED A CAMP TRAILER (EXPLAINS WIDE LOAD SIGN)TO BROCHET THEN DROVE ALL NIGHT TO WHERE THE BROKEN SEMI TRUCK WAS. 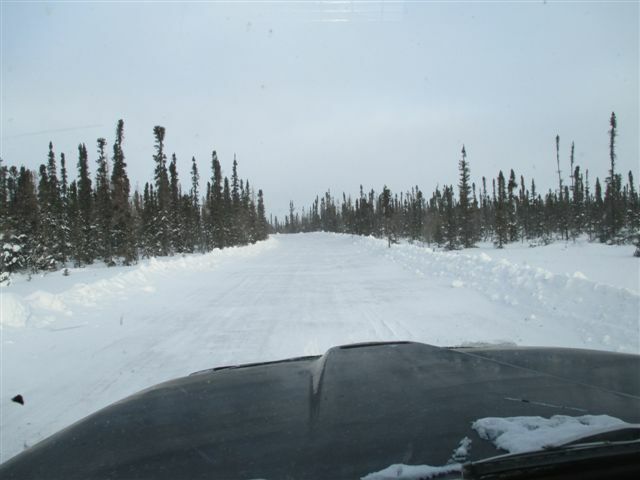 WHEN I ARRIVE THE TRUCK HAD BROKEN DOWN IN THE WORST PALCE TO BREAK DOWN, ON A NARROW CURVE. 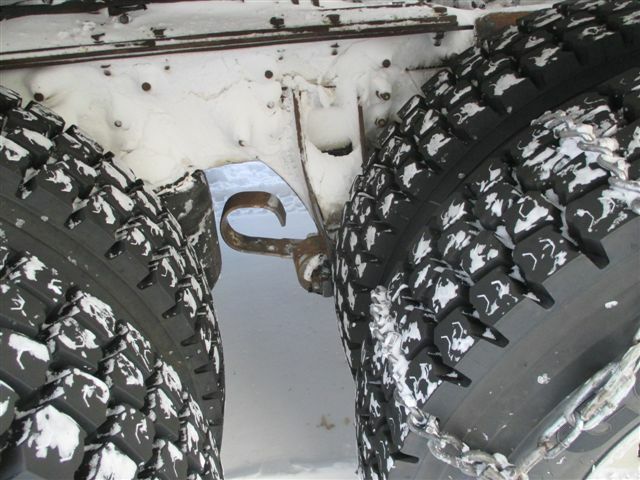 THE BACK SPRINGS ON THE TRUCK ARE 1.5" HICK AND THEY SNAPPED LIKE A TOOTH PICK IN THE COLD WEATHER. WHEN YOU HAVE THE SPRING GUIDE THING HANGING OFF TO THE SIDE YOU KNOW THINGS ARE BROKEN. THIS IS NOT A GOOD PICTURE BUT ONCE THE SPRINGS BREAK THERE IS NOTHING HOLDING THE REAREND IN LINE. 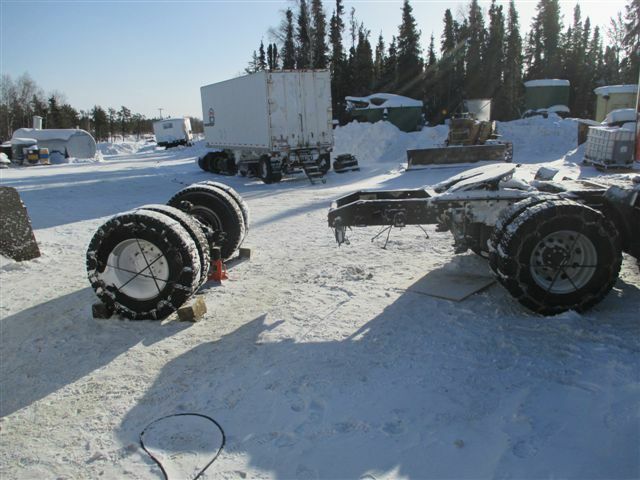 THEN THE DRIVE SHAFT FLIPS ALL OVER THE PLACE AND SMASHES ALL THE "ABS" BRAKE CONTROLS, AIR POTS FOR THE BRAKES AND ANYTHING ELSE THAT IT CAN DESTORY. FIRST THING TO DO IS REMOVE THE REAREND AND ANYTHING TAKEN APART IS DONE CORRECTLY. THIS SAVES TIME ON THE RE-ASSEMBLY BACK IN THE "KINGDOM". THERE IS NOT MUCH ROOM TO WORK ON THIS NARROW CORNER BUT WE GET IT DONE. 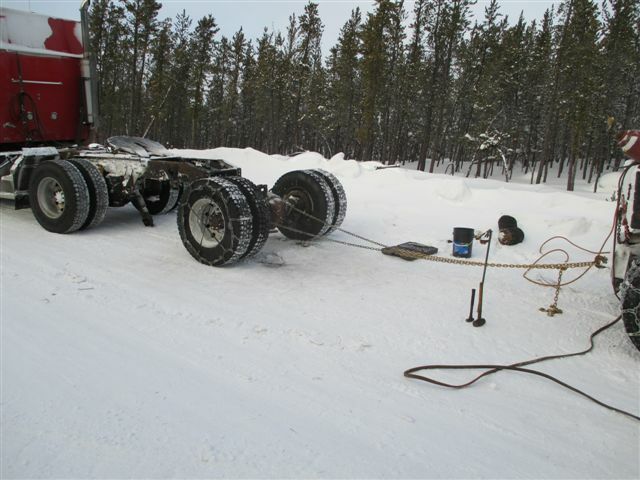 THEN I USE THE "WICKED WINCH" TO DRAG THE EXTRA REAREND UP ON TO THE BACK OF THE WEIGHT BOX FOR TRANSPORTATION HOME. NOW WE HAVE A 2 CAR PARADE BACK TO THE "KINGDOM". 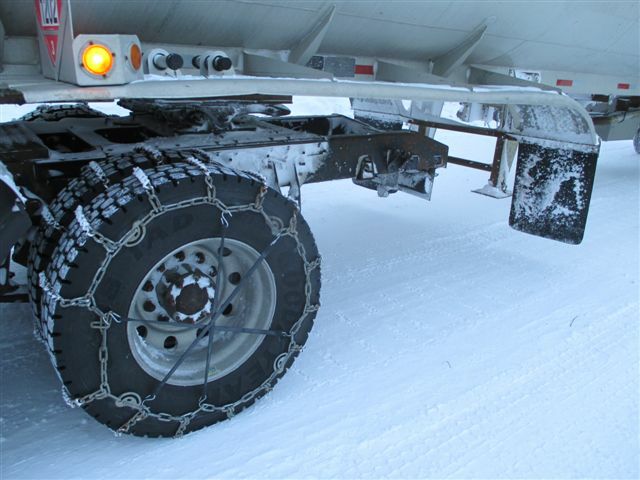 THE SEMI TRUCK CAN DRIVE ITSELF ALONG WITH ONLY A SINGLE REAREND AND TRIPLE CHAINS ON THE TIRES FOR TRACTION. BACK IN THE "KINGDOM" RE-ASSEMBLY BEGINS WHICH ONLY TAKES ABOUT 6 HOURS USING NEW PARTS. THE TRICK IS TO GET EVERYTHING LINED UP. IF IT DOES NOT LINE UP THEN THE 1939 CHEVY WILL MAKE IT LINE UP. DOING THIS RECOVERY THE KING of OBSOLETE WAY WHICH IS COMMON SENSE. 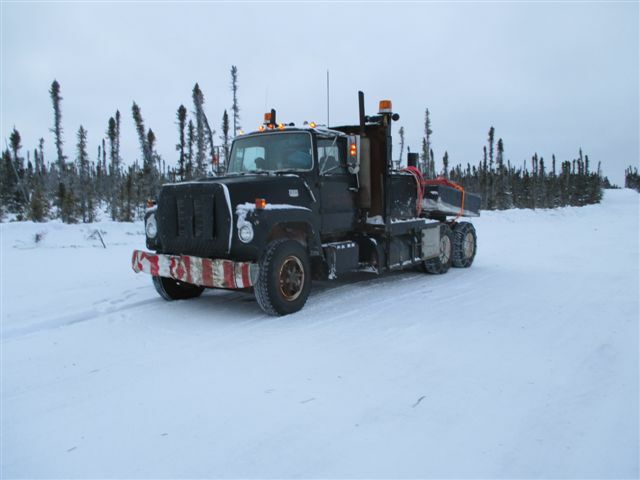 THIS SAVES ALOT OF MONEY COMPARED TO THE ORGINAL WAY OF DOING IT WITH 2 SEMI TRUCKS. PLUS THE BROKEN SEMI TRUCK IS REPAIRED AND ABLE TO CONTINUE TO HAULING.